Nanquan told the previous story to Zhaozhou and asked his opinion. Zhaozhou then took off his sandals and, putting them on his head, went away. Nanquan said, "If you had been there, the cat would have been saved." The must be of like hearts and like minds before this is possible. Only one on the same road would know. He does not avoid trailing mud and dripping water. Singing and clapping, they accompany each other; those who know the tune are few. He adds error to error. A second try isn't worth half a cent. Should cut in two with one sword for him. When the heart is crooked you don't realize the mouth is bent. When struck, he reverberates immediately; when pushed over, he knows how to roll and come out upright. Once the monks of the Eastern Hall and the Western Hall were disputing about a cat. Nanquan, holding up the cat, said, "Monks, if you can say a word of Zen, I will spare the cat. If you cannot, I will kill it!" Nanquan finally killed the cat. He asked Zhaozhou to complete the koan. It was their lesiure time in Changan. The sandals on the head -- who has guessed? Returning home, they were at rest. On getting back home, then there is rest. The good listener's indeed appreciative. A connoisseur is to be lauded. For cleaving the mountain to free the river only Yu is honored. For smelting stone and mending heaven only Guonu is capable. In smelting rock and mending the sky, only Guonu is considered best. putting sandals on the head is worth a little. Wearing sandals on his head, he attains a bit. true gold does not mix with sand. Only this real gold is not mixed with sand. What is the meaning of Zhaozhou's putting his sandals on his head? If you can give a turning word concerning this matter, you will be able to see that Nanquan's command was not meaningless. But if you can't, look out! Danger! Even Nanquan would have begged for his life. When Zhaozhou doffed his straw sandals, what state was this? I would remark, "Where there's no style is also stylish; for the moment he lets out a pathway for you." A lot of people try to figure out the part where Zhaozhou puts his sandals on his head, but would you not doubt if Zhaozhou had put on a bandanna and left? Or would you still doubt? In any case, without the eye on the forehead you cannot know this. "If you had been here..." Oh dear! Nanquan has the head of a dragon but the tail of a snake. Is it really so? Is there any saying whether he would have saved the cat or not? Cutting the cat in two did not complete the koan; Zhaozhou's action supplied the finishing touch. Was Zhaozhou saying that he was no longer concerned with battling against self-centered thinking? Zhaozhou's action was performed as smoothly and naturally as water running in a stream. A certain thought must have been in Zhaozhou's mind, but it was a thought that came prior to reasoning, that is, an intuitive action. 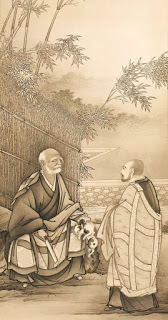 If we were to paraphrase it, we might say: When I was studying Zen there were many difficult and serious problems, but now that I have forgotten Zen, everything has become upside down. Zhaozhou is able to settle the case. He listens to the story told by Nanquan, takes off his straw sandals, puts them on his head, and walks away. Nanquan approves. The active edges of teacher and disciple conform seamlessly. But what is Zhaozhou's meaning? How do you say a turning word that would save the cat? The turning points of these two adepts are subtle and profound. Leap free of the words if you really want to see into them. The old master tried to cut open a trail for them. Sandals on his head, a pure spring breeze followed him out. Is this mere stoicism on Zhaozhou's part? Does Zhaozhou's response mean we should close our hearts to the suffering of other beings? If you would think that Zhaozhou was divorcing himself from the screeching and scratching and splattering of the dying cat, you don't understand Zhaozhou's action, nor what it means to save the cat. Is he just playing the jester, implying Nanquan made a mess of things and got everything all upside-down. 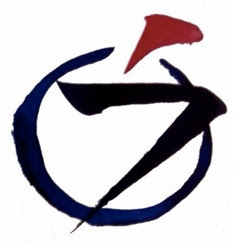 Zen practice is not about killing your compassionate heartfelt responses to life and its events. When things get uncomfortable, most people divert their attention by withdrawing, getting angry or depressed, or numbing themselves to their own feelings. That's not the Zen Way. Unless you open your heart, you cannot say a word to save the cat. I took off my sandals, placed them on my head. If you had been there, you could have saved the cat. You two on the same road would know that. The sandals don't purr, and torn they won't scream. If someone dies for them these puzzles matter. You must try to care, if you wish to live. How dear to me are they all!